mathematics in Engineering and Science L. R. Mustoe Loughborough University, UK M. D. J. Barry University of Bristol, UK In today's world, technology plays an increasingly important role. At the same time, mathematics is finding ever wider areas of application as we seek to understand more about the way in which nature works. Traditionally, engineering and science have relied on mathematical models for design and for the prediction of the behaviour of phenomena. Although widespread availability of computers and pocket calculators has reduced the need for long, tedious calculations to be carried out manually, it is still important to be able to perform simple calculations in order to have a feel for the processes involved. This book starts with a detailed synopsis of the material included in the authors' related textbook Foundation Mathematics (Wiley, 1998). It then expands the material in the areas of trigonometry, solution of equations and algebra. Vectors are covered next, then calculus is taken forward into geometrical applications. Matrix algebra and uncertainty follow before deeper analysis in chapters on integer variables, differential equations and complex numbers leads towards an appendix on mathematical modelling. Each chapter opens with a list of learning objectives and ends with a summary of key points and results. A generous supply of worked examples incorporating motivational applications is designed to build knowledge and skill. Drill and practice is essential and the exercises are graded in difficulty for reading and revision: the answers at the end of each chapter include helpful hints. Use of a pocket calculator is encouraged where appropriate. Many of the exercises can be validated by computer algebra and its use is strongly recommended where higher algebraic accuracy can be achieved and drudgery removed. The concise and focused approach of Mathematics in Engineering and Science will enable the student reader to approach the challenges of mathematics in a course at university level with confidence. 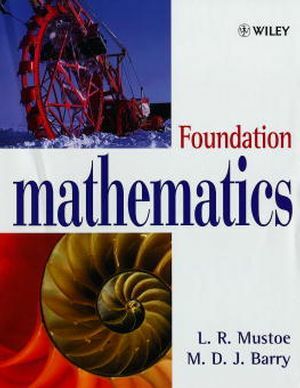 Foundation Mathematics and Mathematics in Engineering and Science are written to be both complementary and independent; students may follow both books consecutively or may use just one, depending on their previous mathematical experience and the level of mathematical development that they wish to achieve. L. R. Mustoe is the author of Mathematics in Engineering and Science, published by Wiley. M. D. J. Barry is the author of Mathematics in Engineering and Science, published by Wiley.